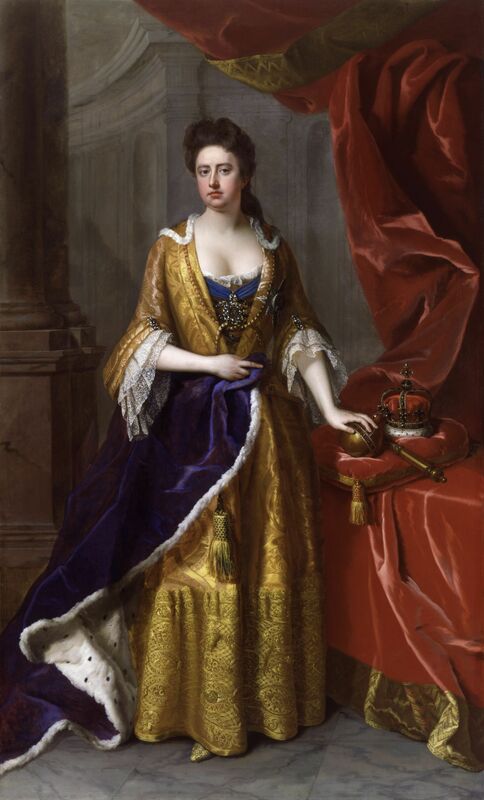 Citation: C N Trueman "Queen Anne"
Queen Anne reigned from March 1702 to August 1714. Anne’s death ended the Stuart dynasty as she had no surviving children. Born on February 6th 1665, her father was James II and her older sister, Mary, had reigned as Mary II along with William III after the 1688 Revolution. Despite her father’s Catholicism, Anne was brought up as a Protestant. On July 28th, 1683, Anne married Prince George of Denmark who was described as “dull but pleasant, fat but faithful” (E N Williams). She got pregnant on seventeen occasions but only gave birth to five living children all of whom died in childhood. The one child she had who many thought would succeed her, the Duke of Gloucester, died in July 1700 of hydrocephalus. A deeply religious woman, Anne believed that her failure to have a family and, therefore, an heir, was a punishment from God for her sins – abandoning her father in his hour of need in 1688 and tying to discredit her young brother as being illegitimate. Historians such as J P Kenyon believed that as Anne got older, the only comfort she had in her life was her religion. It is said that from the death onwards of her son, Gloucester, she was full of remorse for past indiscretions in the eyes of God. When she became Queen, Anne took an automatic dislike to any politician who had been closely associated with William. She also held her first Parliament in disdain after it had called William “our great deliverer from Popery and slavery” – this was in Parliament’s welcoming speech to the new Queen. Anne never enjoyed good health and this got worse as she got older. Anne placed a great deal on the advice given to her by her favourites. The two most prominent were Sarah, Duchess of Marlborough and Mrs Abigail Masham, a cousin of Robert Harley, one of the major political figures of the era. A number of politicians failed to achieve their full political potential as a result of Anne’s input – any politician brought to her attention for immoral behaviour paid the price for this. Anne led a pious life and would not accept that there was any space for licentious behaviour in her politicians. A discreet word from any of her favourites could end the career of a politician. Anne left government in the hands of politicians she trusted. The three most famous were Marlborough, Godolphin and Harley. Between them, the three held most of the important political position in the land and between 1702 and 1704 they worked with the Earl of Nottingham (Secretary of State) while the War of Spanish Succession was being fought. Marlborough, via his wife Sarah, advised Anne on successful government: the Queen must maintain her powers of appointment and that the Queen should administer patronage through a non-party manager. Anne had become queen at a time of real political intrigue. The Whigs and Tories were still comparatively new political parties – even the concept of a political party was relatively new. Both vied for political superiority and they used the War of Spanish Succession to advance their cause. The Whigs had been the party most associated with William III and his attempt to destroy the power of Louis XIV. His death in 1702 gave the Tories an opportunity to regain lost political ground. The most dominant issue that the first parliament of Anne had to deal with was the War of Spanish Succession. The key area that had to be addressed was how the war was to be financed. The Country Tories led by Henry St. John (later Viscount Bolingbroke) did what they could to obstruct the workings of Parliament as they objected to war finance and high taxation. Many Country Tories were suspicious that too many Whigs had a moneyed interest in the war and that Britain’s involvement in it would allow already very wealthy men to become even wealthier – at the expense of the ‘normal’ man. Harley got around this by bringing the more important Country Tories into government; St. John was appointed Secretary of War – not only advancing his political status in the country but also ensuring that he was a stakeholder in the decisions made by the government. Harley himself became Secretary of State in May 1704; a position that allowed him to promote his ‘own’ men with greater frequency. Rather than abuse this position, Harley used it to make the government more politically balanced and moderate so that there would be a united front with regards to foreign policy. Harley brought in moderate Whigs as well as Tories so that the second Parliament of Anne was politically more evenly balanced. He could sell this politically as a leader who was putting the well-being of the nation before his own political beliefs. However few (especially Marlborough and Godolphin) trusted his motives. Many were concerned at the influence his cousin, Mrs Masham, had on Anne and just how much of a political lever this gave to Harley. It was well-known that Anne listened and took on board the thoughts of her favourites – but were they Masham’s thoughts or Harley’s? In February 1708 Harley was suddenly dismissed and few mourned his going. The Whigs became the most dominant party in government. It was this second Parliament that signed the Act of Union (March 6th 1707) with Scotland. The third parliament of Anne’s was dominated by the Whigs. It governed from November 1708 to September 1710 and was led by Marlborough and Godolphin. The peace terms offered to France to end the War of Spanish Succession were so extreme (ordering Louis to attack his grandson Philip V of Spain to push him out of Spain) that France decided it was worth continuing the war. At the time, and for many years after, the Whig hierarchy was accused of deliberately setting the terms at such a high level because they themselves were making very large profits from the war. The Whigs ignored the fact that the county as a whole was war weary. The government then made the mistake of trying to rally the nation around the trial of a maverick called Henry Sacheverell. He was a parson who had used the 21st anniversary celebrations of the 1688 Revolution to openly cast doubts as to its legitimacy. Hoping to unite the nation behind the arrest of Sacheverell, the government seriously underestimated the public response. Sacheverall had been selected by the Lord Mayor of London to give a sermon to the assembled worthies of London for the annual celebration of November 5th – Gunpowder Plot Day. He rounded on the Revolution of 1688 but also denounced bishops and ministers and many other institutions of the day. Sacheverell was impeached, prosecuted and found guilty. However, Sacheverell had been turned into a hero by the heavily taxed people of London who rioted in his favour (the Sacheverell Riots). His punishment was for his sermon to be publicly hanged and to be banned from preaching for three years. He went to work in North Wales and received a warm welcome wherever he went. What Sacheverell had said was not entirely relevant twenty one years after 1688, but it had hit a raw nerve. The constant increase in taxation and the hurt that this caused that primarily affected the poor had not been recognised by those in power. Social dislocation was the last thing that anyone in government wanted and it was clear that Godolphin and Marlborough were on borrowed political time as they were held responsible. Godolphin was dismissed on August 7th 1710 and Marlborough followed on December 31st 1711. Robert Harley made a triumphant return to the forefront of politics. By dismissing two of her greatest government servants, Anne also showed a dark side of her nature. Godolphin was not even granted an audience with the Queen to receive his dismissal – nor a letter. He was simply passed her verbal dismissal. Traditionally, a letter extending gratitude for work done on behalf of the country should have been sent but was not. Marlborough did better than Godolphin. He did receive a letter dismissing him but it was deemed so offensive that he threw it on a fire and never mentioned it again. Harley governed between 1710 and 1714. Now Earl of Oxford, Harley effectively governed as a Prime Minister – though he did not hold that title. There was a large Tory majority in the House of Commons that gave Harley the opportunity to govern more freely. Anne had also appointed 12 new Tory peers so that their representation in the Lords was greater. For all this the Tories were split. Harley and St. John, his deputy, had fallen out when St. John (now Viscount Bolingbroke) made it clear that he wanted to replace Harley as the country’s senior Tory. The Tories were also split over one fundamental issue – the succession. As Anne had got older, her health, never particularly good, had deteriorated. With no surviving children, Britain faced a dilemma. There were Jacobite Tories, the Hanoverian Tories and the Tories who simply did not know what to do. At the same time, the Whigs were united behind the Hanover family. The succession was made more complicated by Anne’s insistence that no Hanoverian was allowed into Britain while she was alive. The future George I had visited England in 1680 – then as Elector George of Hanover – it is said to seek the hand in marriage of Anne. He backed out at the last minute – and Anne was unforgiving right up to the day she died. When Anne died on August 1st 1714, the Tories were in disarray. The Whigs had made it clear that they fully supported the new George I whereas the Tories had shown that they were divided in their support. Ironically when the Privy Council had met on July 30th 1714, the Tories in it were fully supportive of the planned succession and did what they could to ensure a smooth transition once Anne had died. However, the new king sided with the Whigs and to all intents the Tories were out of power for the rest of the century.